In recent years U.S. Forest Service and Bureau of Land Management officials have been working with the ATV riding population to develop a plan for Off Highway Vehicle (OHV) use that suits the best interests of both recreational riders and the land. The Travel Management Rule of the Off Highway Vehicle program regulates that National Forests shall designate all areas, roads and trails open to motor vehicles. Each area will be designated for use by a certain type of vehicle and clearly marked on maps that will be available to riders. 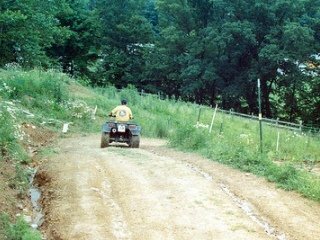 Once the designation activities have taken place by the National Forests, riding in areas not designated for OHV use will be strictly prohibited. The good news is that the process is nearing completion in many areas and designations have been designed through public forums involving government officials and local ATV enthusiasts. While there are those that feel USFS management of OHV use is an attempt to keep motorized recreation out of the National Forests, the plan clearly states that by no means do Federal land managers want to keep OHV users out of the woods. However with nearly 1.8 million OHV users visiting National Forest lands annually, unrestricted use began taking its toll on the land. The new travel management rules are an effort to keep recreation access and land management in balance. When heading out to ride on National Forest Lands, be sure to know where you can and can’t be. Completed OHV designation maps are available from the Forest Service on-line at: http://www.fs.fed.us/recreation/programs/ohv/ohv_maps.shtml . Note that not all areas are open to all types of vehicles, or year round. For instance, an ATV may be allowed where a four wheel drive vehicle is not, and a trail open during the summer may be closed for use during the winter months. Refer to your map before each ride and respect the boundaries of designated OHV areas. Remember that many National Forests are intertwined with parcels of private lands. Never trespass and respect any gates or barricades that you may come across. Stop by the local ranger station before heading out on a ride in new areas. I have yet to come across a Forest Service staff person who wasn’t more than happy to hand out maps, talk about current issues in their district and give a Smokey Bear sticker to the kids. This is a great place to find out about fire danger, recent animal sightings or trail openings and closures. Make sure that your ATV is equipped with a USFS approved spark arrester. The risk of fire is a major concern on Federal lands and you don’t want to be the guy who ticked off Smokey Bear. Riding on Federal lands without an approved spark arrester is not only dangerous, but leaves the potential for steep fines if caught. Or, even worse, the responsibility to pay for fire suppression costs in the event that you start a fire. Those planes that drop retardant aren’t cheap to fly. Obey speed limits and safety regulations. Many trails and designated riding areas will have a maximum speed limit. Be sure to pay attention to your speed for the safety of yourself and other riders in the area. Wear a D.O.T. approved helmet at all times and be aware of your surroundings. Tread Lightly. Keep OHV areas and trails clean. Shove your beef jerky wrapper in a pocket instead of leaving it on the ground, and avoid spilling oil and fuel on the ground at staging areas. Most of the areas we love to ride in are pristine. Natural. Beautiful. That all goes down the drain with litter and junk scattered along the trail. I have faith that the U.S. Forest Service will continue to work with recreational motorists to ensure that access is always available to National Forest Lands. However, as recreational OHV users, we must keep our end of the bargain by respecting the boundaries of OHV use areas, respecting the land and respecting one another. Fair deal? I think so.